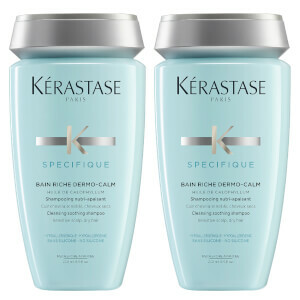 Nourish dry locks and sensitive scalps with the Specifique Dermo-Calm Bain Riche Shampoo from Kérastase, an innovative formula enriched with botanical extracts to help rid hair of impurities and grease whilst calming scalp irritation and hydrating the lengths. Hypoallergenic and free from silicon, it’s infused with comforting Calophyllum Oil as well as Glycerin, which works to repair from within and form a protective barrier. Piroctone Olamine revitalises dry ends and seals in moisture, whilst Menthol extract adds a burst of refreshment. The gentle cleanser reduces feelings of itchiness and sensitivity and leaves you with soft, shiny and supple tresses. Hypoallergenic, dermatologically tested and free from silicon. Apply to wet hair, emulsify, massage and rinse. Aqua / Water, Sodium Laureth Sulfate, Peg-200 Hydrogenated Glyceryl Palmate, Laureth-5 Carboxylic Acid, Glycol Distearate, Glycerin, Peg-60 Hydrogenated Castor Oil, Polysorbate 20, Hexylene Glycol, Peg-7 Glyceryl Cocoate, Disodium Cocoamphodiacetate, Sodium Chloride, Sodium Benzoate, Polyquaternium-10, Sodium Methylparaben, Piroctone Olamine, Sodium Hydroxide, Carbomer, Salicylic Acid, Ethylparaben, Menthoxypropanediol, Helianthus Annuus Seed Oil / Sunflower Seed Oil, Calophyllum Inophyllum Seed Oil, Ci 42090 / Blue 1, Citric Acid, Parfum / Fragrance. I often buy the sensitive shampoo. I previously used shampoo prescribed by my GP, but the Kerestase works better for my exzema. I also like that there is no build up of products in my hair. 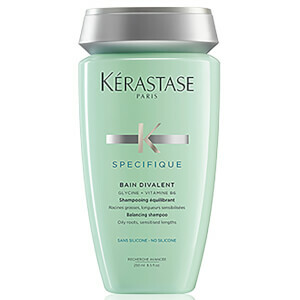 This is my first time trying a Kerastase shampoo after hearing all the good things about it. I had been switching shampoo in the last few months and decided to develop dandruff, so I thought I would try Kerastase. First impression, it was amazing! No more dandruff the next day, hair feels very light and fresh, and fragrance was not overdone. (Some shampoo add way too much!) However, what I have noticed is that, my hair gets more greasy on the 2nd day. I used to be able wash my hair every another day, but with this shampoo, I struggled a little. Some days, it becomes too greasy on the first day.. which is a bit disappointing. So, I might try another Kerastase or have to try another cheaper professional shampoo. I thought I was getting dandruff which I’d never suffered from. I went to the hairdresser and she said it was just dry scalp and to try this. I did and within 2 washes I noticed a difference. After a couple more washes it was gone. It was a lifesaver. I am very doubtful of miracle products but this genuinely works. Delighted with this, was suffering an itchy sore irritated scalp - I think a reaction to another product- and this has calmed it down perfectly, I've had no issues since, and have been able to use my regular conditioner Lait Vital and kerastase oil / styling spray as usual with no issues. Perfect for thick, dry hair! I have used all kinds of product for the last 15 years... 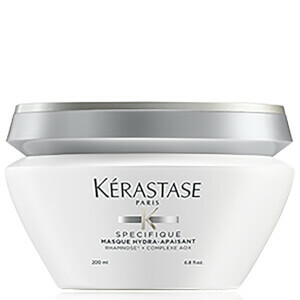 Nothing compares to Kerastase, absolutely nothing! Very good for very dry, thick hair. It makes your hair manageable straight away. 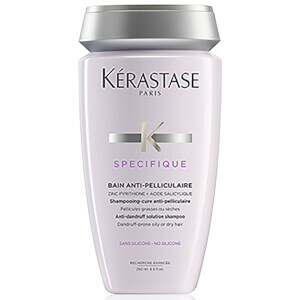 I have decided to buy it after doing an on-line test for types of hair and what you need on Kerastase site. Developed eczema around my hair line and my scalp was so irritated and itchy . I tried all the usual shampoos and none worked. Was recommended this shampoo in a saloon . It soothed my scalp no mor irritation or itch. Eczema gone. So I stopped using it .slowly my scalp became irritated and the dry scaly hairline returned . I will not be without it ever agai. Well done kerastase on a wonderful product . And thank you look fantastic on such good prices and delivery . Absolutely terrible. Leaves hair dry & impossible to brush through! I love this shampoo it doesn't dry the ends and throuralky cleans my scalp. Although I was disappointed not to receive my free gift for two purchases, they said the gift was out of stock, I assume they would provide a replacement. I was disappointed.